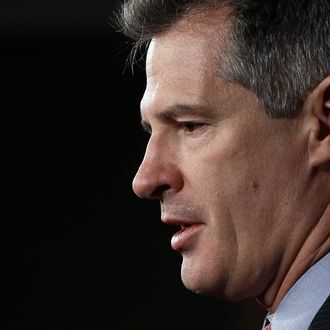 After he lost his senate seat to Elizabeth Warren in 2012, Scott Brown flirted with the idea of running for governor of Massachusetts or being a Fox News talking head, but on Thursday, he officially announced that he’s running to unseat Senator Jeanne Shaheen in New Hampshire. No one has represented two states in the Senate in more than a century, but New Hampshire Republicans are willing to look past the fact that Brown was wooing Massachusetts voters just a year and a half ago. “We’re here because we can count to 51,” said John Sununu, the state’s former governor, while introducing Brown in Portsmouth. “Fifty-one Republican senators. That’s what it’s all about in 2014.” And uh, Brown seems like a great guy, too.